As not everyone here trades futures, I will start incorporating the CFD price analysis as well. So I will keep the two as separate as possible and add it into the webinar and summary videos going forward. Good morning traders, welcome to today’s DAX 30 analysis. The DAX closed 177 points lower on Friday, creating the largest daily candle seen since mid-August. 12,300 has been a strong level of support, but Friday crashed through that zone and closed at 12220. The majority of Friday’s trading volume was focused on the lower third of the daily candle, so momentum is definitely bearish for now. On Friday, the Dax suffered in particular from the developments in Italy. European equity indices closed in the red on Friday on the back of political uncertainty in Italy. The Italian government decided to approve a 2.4% budget deficit for 2019 despite the economy minister Giovanni Tria’s opinion that the deficit should not exceed 2%. European Union Economic Affairs Commissioner Pierre Moscovici warned Rome must cut its “explosive” debt but said the union wants to avoid a crisis in Italy. A default here would spell the end for the EUR. This strengthens the bearish argument. 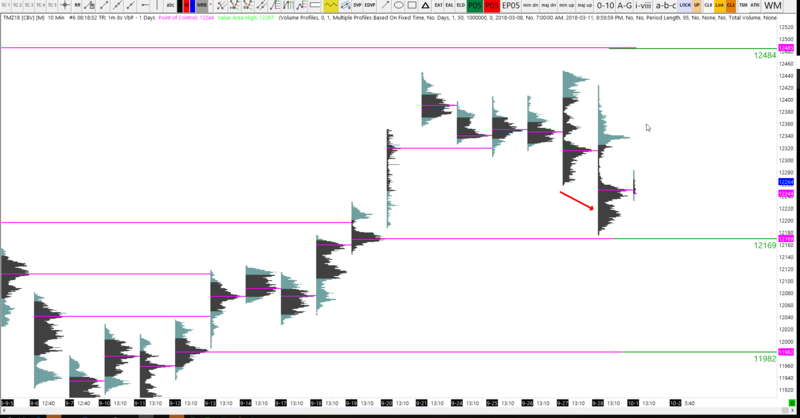 There is a low volume zone from the Friday profile, see below. If price manages to break through the VWAP and pivot on this chart, and pierce that low volume area, then perhaps price can reach one of the two shaded areas. 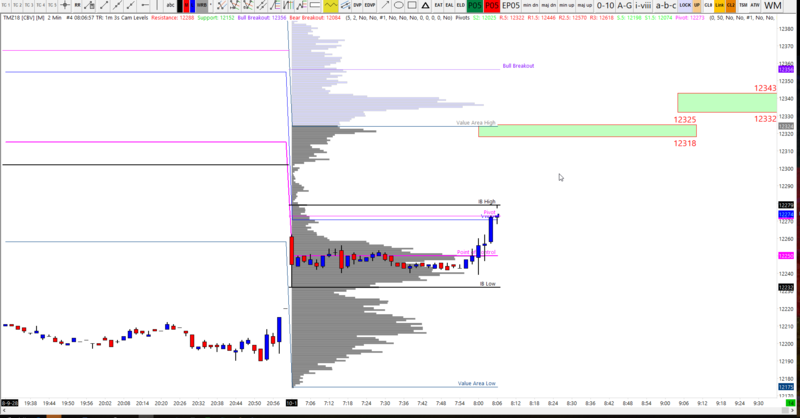 There is an exposed POC at 12169 that would be the most obvious target to the downside. Beyond this, 12080 is the next area of focus and then of course the 12,000 major level. We are looking for a potential ZigZag pattern to form. If so, then we can speculate an extension of the next bearish minor-wave and this could provide another target. We discussed this idea in the webinar this morning. So we will revisit that tomorrow. Regarding the minor swings, our recent low is 12175, so a 1% retracement is approx. 12296. The minor swings are bearish below that. Chris hosts a webinar most mornings around 7am UK time. 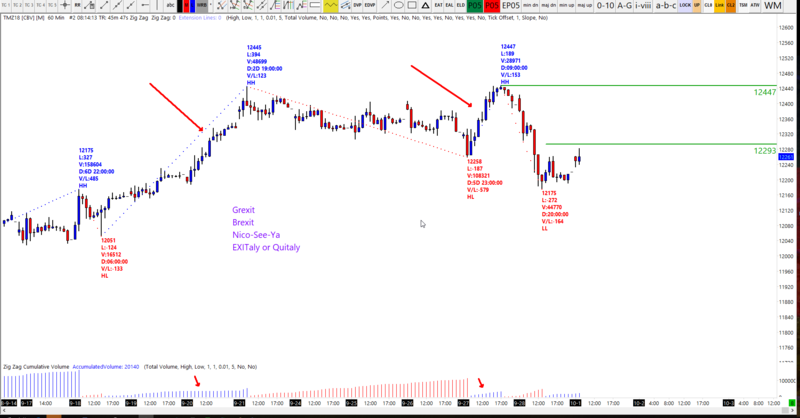 The webinars focus on DAX 30 analysis, specifically understanding price action and applying swing trading techniques and tools. To access the webinar, you will need to be a member of the DaxTrader telegram channel. Click this link to access that channel. The webinars usually last 25-30 minutes and are recorded. However, the recordings are only available for premium/gold members. Find out more about membership by clicking here. 12484 is the most recent exposed point of control to the upside. 12169 is the most recent exposed point of control to the downside. 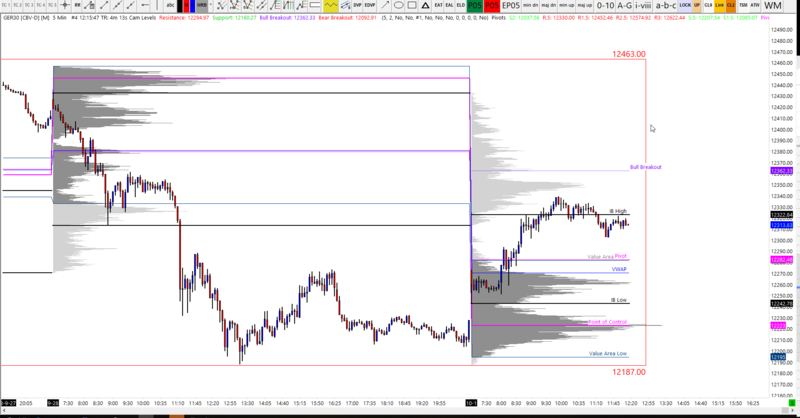 Depending on which way the DAX 30 moves, these levels are likely targets.